Well, prime proposal season (Christmas and New Year), and second-most-popular-proposal-day (Valentine’s Day) have both been and gone. 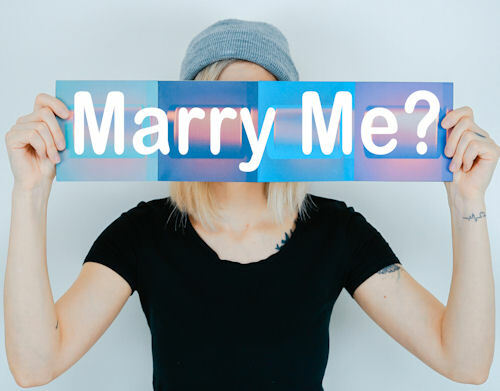 If you are female and in a relationship, the notion that it must be the man who proposes is regarded to be gold standard for proposals can be very frustrating. Particularly as there is only one historically socially “acceptable” day on which a woman can propose to a man – and as there is no 29 February in 2019 - patience will have to be a virtue. Or not! There’s a strong belief that that the male proposing is the “proper” way, and the way it always has been. Actually, not so. I like to think of it as an interim tradition. For thousands of years it was the family of either the bride or groom who pitched to the other with an offer to good to refuse – we’ll exchange our daughter/son with your family in return for a strategic political or economic alliance. The couple had little or no say in it at all. And then things moved on and in the 19th century, couples marrying for love became accepted. But women were still considered to be under the control of the men in their lives, so the groom would have to seek the bride’s father’s permission to propose, which tacitly meant getting his agreement that he would transfer the care and control of his daughter to the groom at the wedding. At the time, and well into the 20th century, women were quite restricted in what they could do, careerwise, after marriage. Until 1966, women employed in the Australian public service had to resign on marriage. If their job was one that was considered unsuitable for a man (such as typists) they could return as temporary staff, but could not be permanent or hold a supervisory position, so earnings were kept constrained. In that climate, a woman asking a man to marry her would have been considered quite rude, except for that one day every 4 years – 29 February. And there was a socially approved get out of jail clause for the men. If they refused they were required to give her a pair of gloves! That in itself should be a clue that it is a tradition that has long passed it’s use-by date. When was the last time you wore a hat and gloves to go to the shops or into town (except in the middle of winter)? So why does this particular tradition remain such a stubborn part of our collective consciousness? Why do so many women wait patiently for years of “dating”, and often experiencing all of the other milestones that used to come after marriage – house, children, and so on? Beats me. Occasionally when I’ve been doing a naming ceremony I’ve commented to the mother of the child that maybe the next time I see her will be for their wedding. And many’s the time when the answer has been, I’m waiting for him to propose. I always egg them on pop the question themselves. Case in point. Lovely, lovely couple. I had the discussion with her three times, after each naming. Eventually, she did. And he told me later that it wasn’t that he didn’t want to get married, he just didn’t know he was expected to formally propose! Anyway, they got married. Lovely, happy wedding, and one of the strongest marriages you could ever wish to see. Times are changing. Slowly, when it comes to who pops the question, but more and more couples are telling me that she popped the question. And he was delighted that that stress was taken off his shoulders. So, don't wait another year. Go for it, girls. Trust me. You're not going to end up with a pair of gloves!